At ProSource® of Oxnard, our team members take our trade professional members and their homeowner clients’ kitchen remodels seriously. The kitchen area is one where your client will cook, clean, relax, entertain guests, and more! We want to make sure we offer you high-quality kitchen remodel products at low wholesale prices from brands we trust most. Kitchen cabinets are an easy way to dress up your client’s kitchen, simply by choosing a sophisticated wood and color finishing combination. 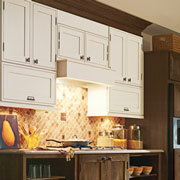 Cabinets also are a great functional element of the kitchen, adding storage and saving your client some counter space. 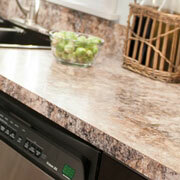 Our showroom offers a broad variety of kitchen cabinets — visit us today. 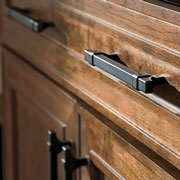 Cabinet hardware includes detailed kitchen features such as appliance pulls, end caps, hooks and knobs. Though these might seem virtually unimportant, choosing the right cabinet hardware can put the perfect final touches on your client’s kitchen remodel. Whether your client wants quartz, granite, blended materials or recycled materials, chances are we have a kitchen countertop that will match their home’s style and design. Kitchen countertops are a phenomenal way to add flair to a room, but they also endure a lot of wear-and-tear, so finding one that is as equally functional as it is beautiful is important to keep in mind. 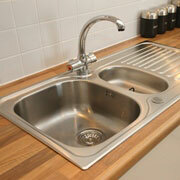 Our kitchen sink collection boasts sinks with varying bowl numbers, and sinks that come in materials such as stainless steel and fireclay. Since the kitchen sink will be a focal point of your client’s kitchen, let our team help you find them the perfect one for their everyday lifestyle. 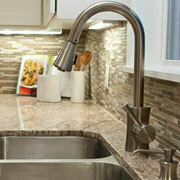 Kitchen faucets aren’t one-size-fits-all anymore — they have many different functions, and they come in many different styles, sizes and colors.